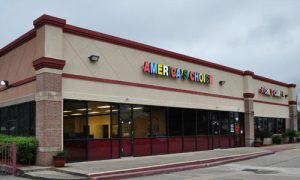 Americas Choice Childcare in Dairy Ashford is located in the heart of briar forest. We are conveniently located on Dairy Ashford Rd between Briar Forest Dr and Westheimer Rd in the Briar Forest neighborhood. We continue to raise the standards in early childhood education. Our trained, qualified, and caring staff takes a hands-on approach to learning. Our early childhood learning center provides quality programming for children, ages six weeks to 12 years old. Our Dairy Ashford Daycare lends itself to learning as well, by including age appropriate playgrounds, library, and other quality facility features. To provide peace of mind to the parents, the facility has secured entrance. We encourage you to come by for a visit to our Briarforest Childcare Center. Please call 281.496.4114 to schedule a daycare visit. We look forward to providing your child a safe and happy childcare experience!